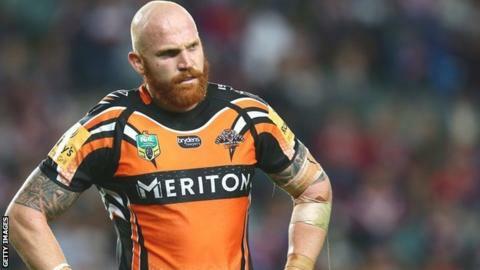 Leeds Rhinos have signed Wests Tigers prop Keith Galloway on a three-year deal. The 29-year-old Australia international will join the Rhinos for the start of next season after being released from the final year of his contract with the NRL side. Rhinos coach Brian McDermott told BBC Radio Leeds: "We needed someone with experience and drive to keep winning. "He's a tough, uncompromising prop who gives you plenty of game time." Galloway told the club website: "I am really excited to be coming to the Rhinos. I can't wait to get over there and play for Leeds. "One of the reasons I was sold on the Rhinos was the chance to be part of a team that is competing for silverware. I have never tasted success at senior level and hopefully I can achieve that at Leeds."